In the thirteenth century, in France, Germany, and particularly, Italy, under the influence of Francis of Assisi a strong tradition of popular Christmas songs in regional native languages developed. Christmas carols in English first appear in a 1426 work of John Awdlay, a Shropshire chaplain, who lists twenty five "caroles of Cristemas", probably sung by groups of 'wassailers', who went from house to house. The songs we know specifically as carols were originally communal songs sung during celebrations like harvest tide as well as Christmas. It was only later that carols begun to be sung in church, and to be specifically associated with Christmas. 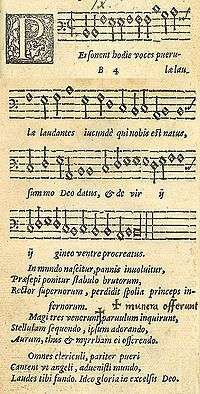 Many carols which have gained popularity today were printed in Piae Cantiones, a collection of late medieval Latin songs which was first published in 1582. Early, Latin forms of carols such as "Christ was born on Christmas Day", "Good Christian Men, Rejoice" and "Good King Wenceslas" can be found in this book. "Adeste Fideles" ("O Come all ye faithful") appears in its current form in the mid-18th century, although the words may have originated in the thirteenth century. The origin of the tune is disputed. The publication of Christmas music books in the 19th century helped to widen the popular appeal of carols. The first appearance in print of "God Rest Ye Merry, Gentlemen", "The First Noel", "I Saw Three Ships" and "Hark! The Herald Angels Sing" was in Christmas Carols Ancient and Modern (1833) by William Sandys. Composers like Arthur Sullivan helped to repopularize the carol, and it is this period that gave rise to such favorites as "Good King Wenceslas" and "It Came Upon the Midnight Clear", a New England carol written by Edmund H. Sears and Richard S. Willis. The publication in 1871 of Christmas Carols, New and Old by Henry Ramsden Bramley and Sir John Stainer was a significant contribution to a revival of carols in Victorian Britain. 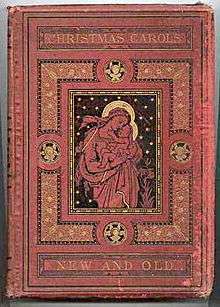 In 1916, Charles Lewis Hutchins published Carols Old and Carols New, a scholarly collection which suffered from a short print run and is consequently rarely available today. The Oxford Book of Carols, first published in 1928 by Oxford University Press (OUP), was a notably successful collection; edited by the British composers Martin Shaw and Ralph Vaughan Williams, along with clergyman and author Percy Dearmer, it became a widely used source of carols in among choirs and church congregations in Britain and remains in print today. Today carols are regularly sung at Christian religious services. Some compositions have words that are clearly not of a religious theme, but are often still referred to as "carols". For example, the sixteenth century song "A Bone, God Wot!" appears to be a wassailing song (which is sung during drinking or while requesting ale), but is described in the British Library's Cottonian Collection as a Christmas carol. As recently as 1865, Christmas-related lyrics were adopted for the traditional English folk song Greensleeves, becoming the internationally popular Christmas carol “What Child is This?”. 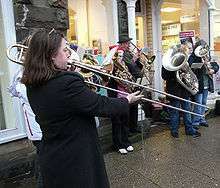 Little research has been conducted on carol singing, but one of the few sociological studies of caroling in the early 21st century determined that the sources of songs are often misunderstood, and that it is simplistic to suggest caroling is mostly related to Christian beliefs, for it also reinforces preservation of diverse national customs and local family traditions. Compositions continue to be written that become popular carols. For example, many of the carols written by Alfred Burt are sung regularly in both sacred and secular settings, and are among the better-known modern Christmas carols. Charles Wesley wrote texts for at least three Christmas carols, of which the best known was originally entitled "Hark! How All the Welkin Rings", later edited to "Hark! the Herald Angels Sing". A tune from a cantata written by Felix Mendelssohn in 1840 was adapted by William H. Cummings to fit Wesley's words. This combination first appeared in "Hymns Ancient and Modern" in 1861. In Australia and New Zealand, where it is the middle of summer at Christmas, there is a tradition of Carols by Candlelight concerts held outdoors at night in cities and towns across the country, during the weeks leading up to Christmas. First held in Melbourne, "Carols by Candlelight" is held each Christmas Eve in capital cities and many smaller cities and towns around Australia. Performers at the concerts include opera singers, musical theatre performers and popular music singers. People in the audience hold lit candles and join in singing some of the carols in accompaniment with the celebrities. Similar events are now held all over Australia, usually arranged by churches, municipal councils, or other community groups. They are normally held on Christmas Eve or the Sunday or weekend before Christmas. A similar recent trend in New Zealand is for smaller towns to host their own Carols by Candlelight concerts. The 19th century "Cantique de Noël" (also known as "Minuit, chrétiens", adapted as "O Holy Night" in English) is another classic. "Dans cette étable" and "Venez Divin Messie" are also popular Christmas carols. Perhaps the best known traditional French carol, "Il est né, le divin Enfant! ", comes from the region of Provence. Some carols familiar in English are translations of German Christmas songs (Weihnachtslieder). Pastoral Weihnachtslieder are sometimes called Hirtenlieder ("shepherd songs"). Three well-known examples are "O Christmas Tree" ("O Tannenbaum"), from a German folksong arranged by Ernst Anschütz; "Silent Night" ("Stille Nacht, heilige Nacht"), by the Austrians Franz Xaver Gruber and Joseph Mohr; and "Still, Still, Still", an Austrian folksong also from the Salzburg region, based on an 1819 melody by Süss, with the original words, slightly changed over time and location, by G. Götsch. Christmas carols in predominantly Catholic Philippines exhibit the influence of indigenous, Hispanic, and American musical traditions, reflecting the country's complex history. Carollers (Tagalog: Namamaskô) begin wassailing in November, with mostly children and young adults participating in the custom. Christmas carols are very popular in Poland, where they have a long history, the oldest dating to the 15th century or earlier. 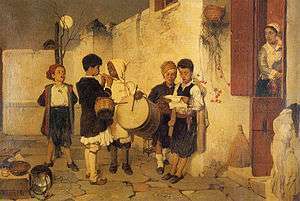 The villancico (or vilancete, in Portuguese) was a common poetic and musical form of the Iberian Peninsula and Latin America popular from the late fifteenth to eighteenth centuries. With the decline in popularity of the villancicos in the 20th century, the term became reduced to mean merely "Christmas carol". Important composers of villancicos were Juan del Encina, Pedro de Escobar, Francisco Guerrero, Gaspar Fernandes, and Juan Gutiérez de Padilla. Popular Spanish villancicos include "Los pastores a Belén," and "Riu, riu, chiu: El lobo rabioso" and "Los peces en el río". Basically all Ukrainian Carols (Колядки), some of them centuries old, are associated with the story of the birth of Jesus Christ. The Ukrainian carol most known to the Western World is the "Carol of the Bells", composed by the Ukrainian composer Mykola Dmytrovych Leontovych, and premiered on December 1916 by a choral group made up of students at Kiev University. Christmas music written in the United States ranges from popular songs, such as "Jingle Bells", to Christmas carols, such as "Away in a Manger", "O Little Town of Bethlehem", and numerous others of varying genres. Church and college choirs celebrate with special programs and online recordings. ↑ Coghlan, Alexandra (2016). Carols from King's. Random House. p. 84. ISBN 9781785940941. Retrieved 7 October 2016. ↑ A Bone, God Wot! ↑ "Dial-a-Carol: Student-run holiday jingle service open 24/7". USA TODAY College. Retrieved 2016-02-24. ↑ Dudley-Smith, Timothy (1987). A Flame of Love. London: Triangle/SPCK. ISBN 0-281-04300-0. ↑ "Festival of Nine Lessons and Carols". BBC. 16 December 2005. ↑ McGee, Timothy J. (1985). The Music of Canada (Cloth ed.). New York and London: W. W. Norton & Company, Inc. p. 13. ISBN 0-393-02279-X. ISBN 0-393-95376-9. (Paperback). ↑ Dizionario Biografico degli Italiani. Treccani. pp. Volume 2.